Gwent Arts in Health and NHS BT are looking forward to the Commemorative Artworks being installed this spring by artists Valerie Harding and Beth Downiing. Over 160 students, staff, relatives and patients took part in the glass workshops at the Royal Gwent Hospital, Nevill Hall Hospital, St Woolos Renal Unit, and Brynmawr Foundation School. 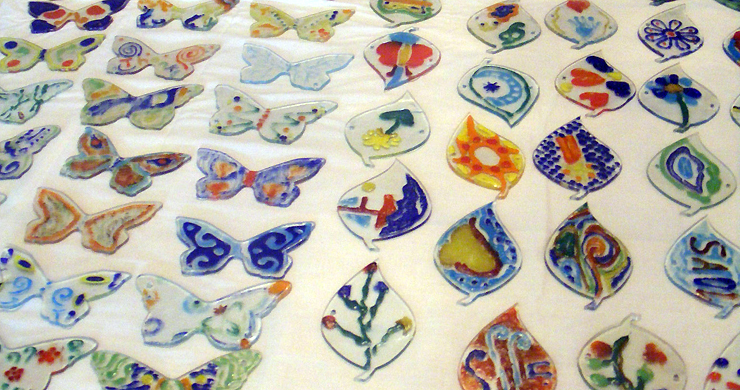 The glass shapes have now been fired and are being added to the two Commemorative artworks which will be on display in the Beechwood Café and the corridor leading to Main Outpatients in Nevill Hall. Valerie and Beth have also worked with students from Coleg Gwent at both Nash and Ebbw Vale sites, who have been working on the project with Specialist Nurses Jo Davies and Nicky Newbound. There is a display of the project so far at Nevill Hall Hospital near the Chapel.